What Is EMF Exposure? And How Does It Affects Your Kid’s Sleep? I went from being a little hysterical about EMF exposure zapping me & my Little Lady at every turn, to a slightly more balanced approach, the day I stopped fighting these little electromagnetic fields. EMF emitting technology, after all, is everywhere and it’s here to stay. But what is EMF exposure and should you be worried about it? EMF (or electromagnetic field) exposure is nothing new. We receive EMFs naturally from the sun and the earth, plus they’re given out by all electrical devices. The main change facing us today is the unprecedented level of man made EMF exposure. This is largely a result of the recent explosion of wireless devices – everything from cell phones and wireless laptops to Bluetooth devices and cell phone towers. High frequency EMF radiation. These have higher frequencies than visible light and examples include ultraviolet (UV) light, X-Rays, and Gamma rays. Low frequency EMF radiation. These have lower visible frequencies than visible light and examples include EMFs from microwaves, computers and laptops, smart meters, WiFi, cell phones, Bluetooth, and power lines. Are EMFS bad for us? It’s already been proven that too much high frequency EMF radiation is potentially dangerous. For example, over exposure to ultra violet light can cause skin burns or eye damage and repeated exposure to radiation can also damage the body’s cells. This can increase the risk of cancer and is why the dose of radiation used in an X-ray is always as low as possible. But low frequency EMF radiation is more problematic. High levels of exposure are a relatively new thing, plus symptoms that some people experience, such as headaches, disturbed sleep or brain fog, can be things that manifest over time, rather than immediately. This is further complicated by the fact WIFI and cell phones are big business. It’s not in the interest of the big cell phone corporations for consumers to know about any potential health implications of long term exposure to EMFs. If you search online, you’ll likely find largely convincing arguments on both sides as to whether EMFs are dangerous or not. However, the The World Health Organization (WHO)/International Agency for Research on Cancer (IARC) has actually classified radiofrequency electromagnetic fields as ‘possibly carcinogenic to humans’ (Class 2B) and Dr Mercola cites some convincing examples of experts who claim there is ‘virtually no doubt’ that cell phones and ‘related gadgets’ can lead to health issues. But it doesn’t end there. Most of us know how important sleep is for children’s mental and physical development. But according to the National Sleep Foundation (NSF), children are sleeping less and less. prescriptions for sleep inducing melatonin in children are also sharply on the rise. The consensus is that our increasing dependency on technology is one of the main factors. 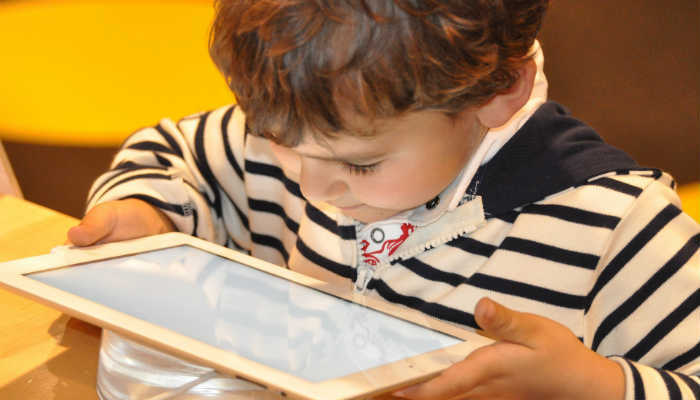 Not only are our kids watching more TV than ever, but many kids are also spending considerable time each day on iPads, cell phones and games consoles. It’s been scientifically proven that blue light emitted by many gadgets such as cell phones and TVs interferes with the sleep inducing hormone melatonin, which gets our brains ready for bed as the sun goes down. Research suggests that EMFs suppress the production of melatonin in a similar way. Combine this with our growing culture of ‘binge TV’ on Netflix, addictive gaming and the pressure for older kids to keep on top of social media and it’s little wonder many kids find it hard to switch off. Perhaps unsurprisingly, too much screen time has also been linked with obesity and a compromised ability to learn or recognise emotions. Research is increasingly suggesting EMFs and blue light from gadgets, such as cell phones, laptops and TVs can affect sleep and even our health. So it makes sense to limit them, where possible, especially in the hour before bed. So is there anything practical you can do to reduce EMF and blue light exposure and help your kids get quality sleep in a world saturated by technology? Whilst technology is a part of life and impossible to avoid unless we live in an igloo in Greenland, that doesn’t mean we can’t take steps practical steps towards reducing EMF and blue light exposure in the home. I cover that in another post on EMF and Blue Light Protection Devices. Testing EMF levels in your home can also be a good way to get a feel for the level of EMFs in you home. The Cornet ED88T EMF Meter comes highly recommended, if budget allows. And if you have a child who has trouble sleeping, you may also find a weighted blanket could help.